"Demilitarization" is the process in which ammunition is disassembled due to terms of military contracts. For example if a term of the military contract between Federal or Lake City is broken they are prohibited from selling the "live ammo" to the public, instead the ammunition has to be disassembled. 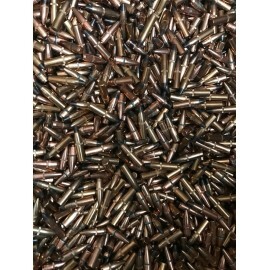 Our bullets are of the highest quality however these are sold in bulk quantities and therefore we guarantee that 99%+ of the product you receive will be as described. Most of the time 100% of the product will be as accurately described above but we want to be clear that sometimes you may get a few mismatched bullets in your order. Please buy understanding this and knowing that we overweigh de-milled items to be sure you get the great value you paid for. If you feel that you receive more than what is reasonable please contact us as we strive to send every single order as advertised. We'll always take care of our customers.